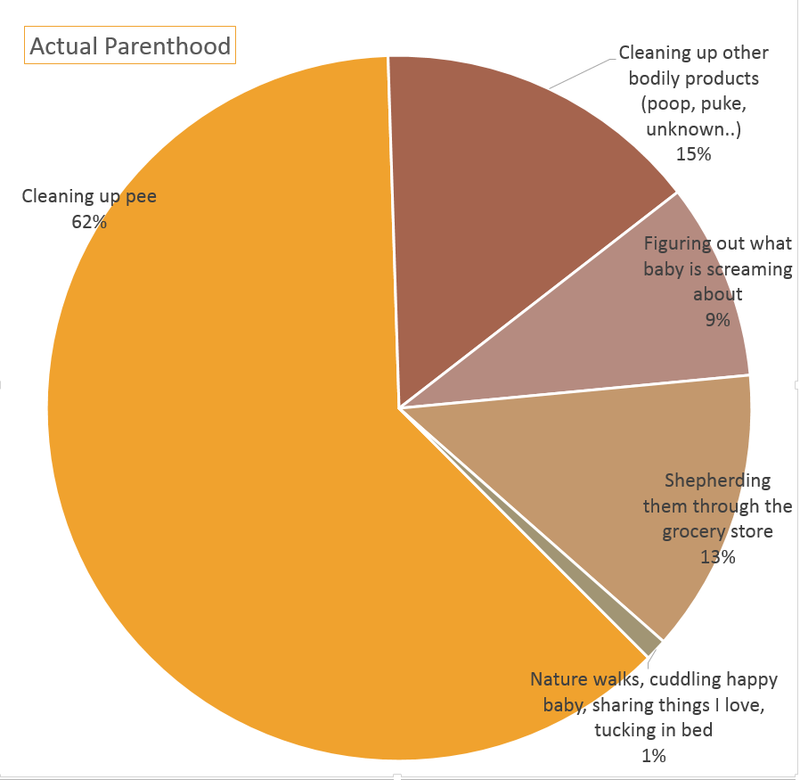 That’s right, I spend 62% of my days cleaning up pee. Of course, I wouldn’t trade any of these little buggers for anything, etc. etc., BUT right now it feels like I’m snowed in by the many mundane and even sucky tasks that parenting entails while, stuffed in every corner of my cluttered mind, the other things I’d like to do for fun and profit never see the light of day. But, enough complaining, I’m trying to claw my way back to the land of the living and this here blog post (acknowledge the problem) is my first little baby step..
Jess, this is SO AWESOME!! 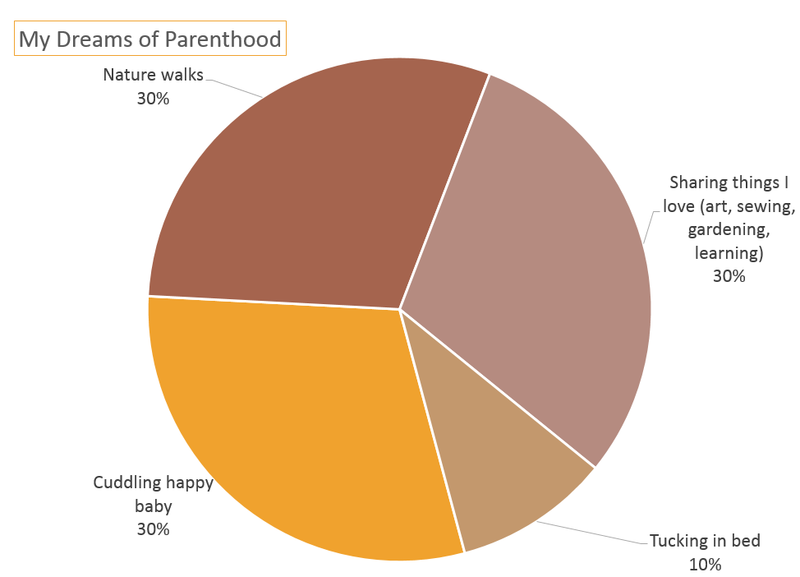 We absolutely love your pie charts. Actually, we have been thinking along the exact same lines, but substituting of course our own struggles between our teaching and our soul-crushing, exhausting, but necessary second jobs, and also the mundane, day-to-day busy-work that teaching requires. We are inspired to make our own pie charts, but are afraid of what they would look like!!!! At this point, the practicing and teaching projects that we would like to be doing COMBINED would probably be a thin line on the chart, with everything else that we don’t want to be doing taking over the rest. But it might provide some entertainment to try to figure out percentages, etc. We feel your pain — our brains are equally cluttered and filled with ideas that seem, right now, unlikely to ever get crossed off our to-do lists. But as you said, all we can do is take whatever teeny little baby steps that are possible right now and rejoice in each one of those baby steps. We must acknowledge each little victory! Thank you for posting this, it truly made our night! Thanks for commenting 🙂 It really does provide some relief to know that we’re all in the same boat sometimes. Don’t tell me all those sweet pictures of you cuddling “little #4” were just playacting! I love the pie charts. Especially the unknown. Hang in there, before you know it, all the pee will be under the control of it’s owner. So the cuddly pictures are me “staying positive” (sure that’s generally how I feel about this parenting gig but you know there’s a flip side to everything..) and the pee post is just a much-needed wallow. Thanks for the encouragement Carolyn! Very interesting presentation of the life of Mother of four sweet children. Doing home schooling doesn’t seem to be in the charts? I think that would make all that great stuff you want to do a big part of what is actually happening. The things you dream of do get communicated to the kids in the choices you make for their education and excursions for family fun… however I never knew there was so much pee to clean up in a single day. Must be the liquid diet that causes that flood. Still I think you have a great life in some of the ways you dreamed of with your family but it is clear to see from your charts there are a few things you want to do more. I really hope your post is a big step in the direction of fulfilling those dreams. Keep on keeping on! You’re right, I didn’t give school its own category! Luckily my 6th grader can do a lot of his work independently, and school for my 5 year old is just “life.” We read lots of books, do simple math problems using toys and other objects, and I do try to take them on lots of field trips when I can. For the 3 year old, it’s mostly mimicking the older ones, and I think honestly she’s learning things earlier than either of the others did because of it. I do have a great life, but sometimes all I can think about is the struggle. 62%? How is that possible? The older 3 are potty trained, aren’t they?